What would you rather eat -Prosciutto Bianco or Cured Pig Fat? A few years ago my sister-in-law gave me the book Charcuterie: The Craft of Salting, Smoking, and Curing by Brian Polcyn and someone who I have become a big fan of, Michael Ruhlman. I was always interested in the topic of curing, but had no idea where to start. I actually didn’t even know it was called “charcuterie” until I started reading. This book quickly became an obsession of mine. I started curing and hanging duck prosciutto in my basement. I cured and smoked my own bacon in my postage stamp-sized backyard in Queens. I asked for a terrine mold for the following Christmas and started making pâtés. Then last year I decided to be adventurous and make lardo. Lardo is basically cured pig back fat. I had had it for the first time six or seven years ago at Otto, a Mario Batali restaurant. It was on pizza and advertised as “Prosciutto Bianco”, I guess it sounds a lot nicer than “seasoned aged pig fat”. Batali’s lardo pizza was (like many of his creations) outstanding and inspirational. I began to do a bunch of research on this newly discovered (by me, anyway) white gold. I researched it’s origins in Colonnata, an old village in Italy nestled in to the base of the Alps. I discovered that it used to be cured in marble vats that were rubbed with garlic and then left in caves to be cured. I found out that unless you can get the fat from a non-commercially raised pig, don’t even bother trying to make it yourself. Luckily, I had just joined my neighborhood CSA and they have an arrangement with a farm that could provide me with a big ol’, 4lb piece of pig fat. I ordered the fatback and stored it away in my basement fridge (so as not to scare Mrs. Notafoodie with a falling hunk o’ fat when she opened the upstairs fridge to get a drink). I followed Ruhlman and Polycn’s instructions and before I knew it, I had a pretty decent tasting hunk of cured, seasoned pig fat. 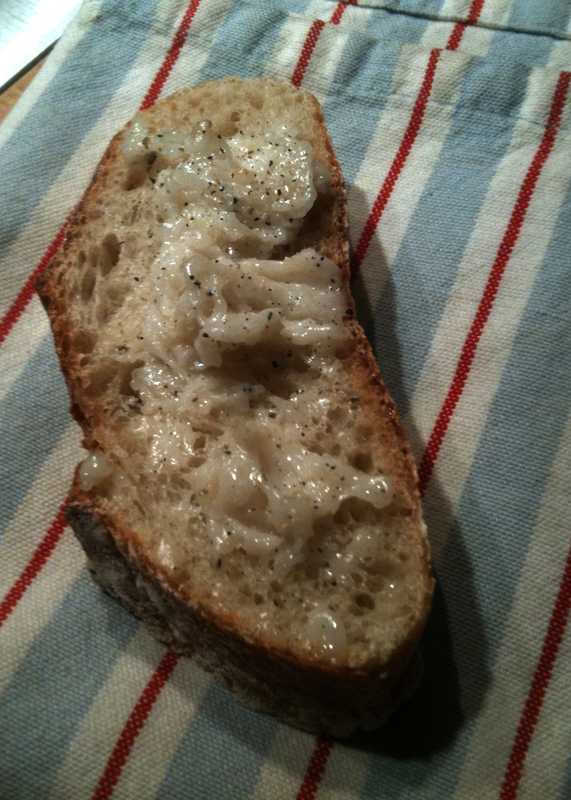 I had made lardo! I have used it in many different ways. I found a recipe for a lardo-studded roast beef that was phenomenal (I’m always a big fan of stuffing one animal in to another animal). I sliced it thin on one of the two deli slicers that we own (A quick aside: Yes, our household contains two slicers. We registered for one for our wedding, and the other was also a gift from someone who never even looked at the registry, but knew that a slicer would be the perfect gift for us. Man, do our friends know how to please or what?). I’ve put the slices on pieces of toast, so that the fat melts almost instantly. I’ve wrapped the slices around asparagus and thrown them on the grill. I’ve layered the slices over a simple pasta with oil and garlic. I’ve also just plain eaten the paper thin pieces of fat by themselves (again, they melt on your tongue and leave porky goodness behind). On Saturday night, we were having some friends over for dinner. As part of my New Year’s resolution to eat a whole pig (not all at once), we made a herb stuffed pork rib roast. I figured that if I was eventually going to eat a whole pig, I was going to have to eat more than one part my porcine friend at this meal. I went down in to my freezer and cut a hunk (probably around 1/4 lb) off of my stash of lardo, and was planning on slicing it thin and serving it on the veggies (roasted brussels sprouts). Then I remembered another meal at another Batali restaurant. 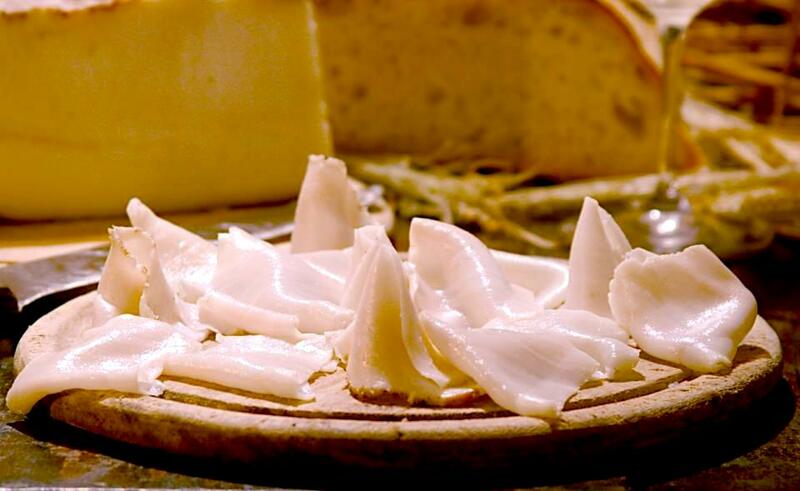 A few years ago, while dining at Del Posto, they served whipped lardo on the table along side of butter. Since, seeing it at Del Posto, I’ve seen it at a number of other restaurants. It was decided. Now I just needed to figure out how to whip this beautiful piece of tasty fat in to a spread. I did a lot of research and figured out that the best way to approach this was to run the lardo through my trusty Food Grinder Attachment for my KitchenAid mixer. Once through, I used a fork to whip it in to airy paste. I tasted it an decided to season it with a minced garlic clove, a little kosher salt, some fresh black pepper, and a bit of red wine vinegar. The result was an awesome spread that I served with appetizers on sliced ciabatta bread. Due to the craziness in the kitchen in trying to make sure everything was done and plated in time, I simply put out my whipped piggy without actually explaining what it was. When I came in to the room, I saw a guest eating it and commenting how tasty it was. When she asked my wife about it, Mrs. Notafoodie told her it was “pig fat”. Clearly she needs to take a lesson from the Batali school of marketing. I think from now on, if asked, I’ll call it “Spreadable Prosciutto”. Don’t tell anyone.